Explanation: October's Hunters Moon shines near the horizon, setting beyond the arches of Whitby Abbey in this eerie night scene. 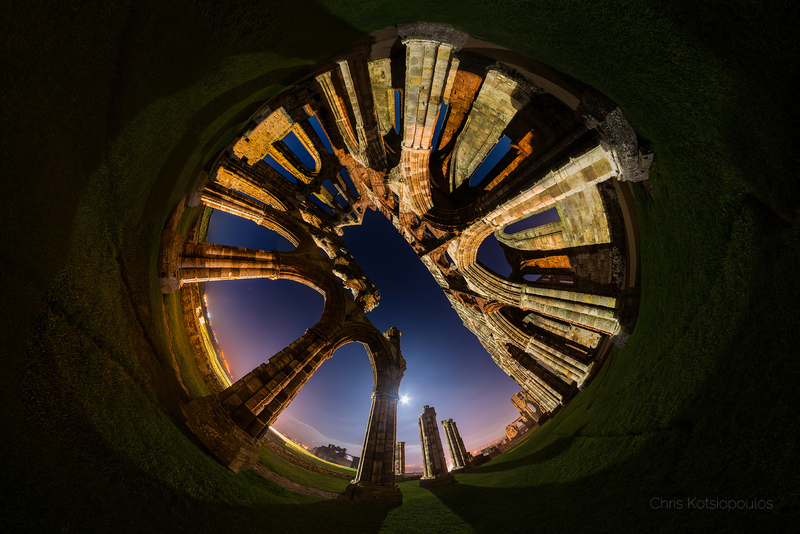 The moonlight partly illuminates the ruined Benedictine abbey's grounds and walls on a cliff overlooking the North Sea from England's Yorkshire coast. Fans of Bram Stoker's 1897 novel Dracula will recognize the abbey and town of Whitby as the location of the Transylvanian count's shipwrecked landing on English shores. There fiction's most famous vampire transformed into an immense dog, jumped ashore and ran up the cliff to the ruined abbey. A 360 degree panorama, the dramatic fisheye view was created from 23 digitally stitched photos.